Are you considering Blogging about your business? If not maybe you should. A blog today isn’t just ‘Blah Blah Blahging’ as a friend of mine once said. 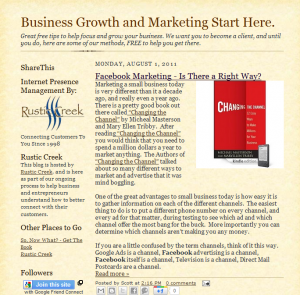 Blogs have evolved into newsletters, opinions and even self-answering FAQ pages. Someone could ask a question and you might not even have to answer it. Wouldn’t that be a time saver. Blogging is really just another way to tell your story. Think of it as an interactive addition to your website. Future customers can see the questions and comments your current customers have. Your blog can help them to decide if you are the right business for them. This saves you time because people who don’t need your services can figure it out ahead of time. It also helps you see what your customers think in a way that is a little more honest. – Write Good Headlines, try two or three out each time. – Post One Topic Per Day until there are 30 postings. – Connect your blog and let everyone know it is out there. How do you get a blog you ask? Very simply there are several good services. Beach Street News is on WordPress and we also use Blogspot and Blogger as well for other topics. All of them work fine and all offer a free service. You don’t even have to host it, they can do it for you. My personal blog is on Blogspot and I just use a “redirect” so it looks like it is on my website. Scottbourquin.blosgspot.com and blog.scottbourquin.com are the exact same blog. If you are running analytics, most blogs will let you add the code so you can see how many visitors you have and what your popular posts really are. You might also want to add an opt-in list for your e-mail list. Don’t have one yet? Stay tuned, I’ll get to that soon. Previous Topic: Ever Seen A Porsche GT-1?